SSC MTS Exam Date 2017 – SSC Multi Tasking Staff Re-Exam in September-October 2017: Are you looking for SSC MTS 2016 New Exam Dates? When SSC MTS Re-Exam will be held? The only question applicants have in their mind who applied for SSC MTS Exam in December 2016 last year. Since then, Candidates are waiting for exam dates for SSC MTS posts. SSC has changes its MTS Exam dates, revised exam dates for SSC MTS 2016 is mentioned below. SSC MTS Re-Exam Will be held in September-October 2017. New Dates for SSC MTS will be announced in due course. Now, we have come up with a good news for all SSC Multi Tasking Staff applicants, SSC MTS Revised Exam will be held on Online Mode. 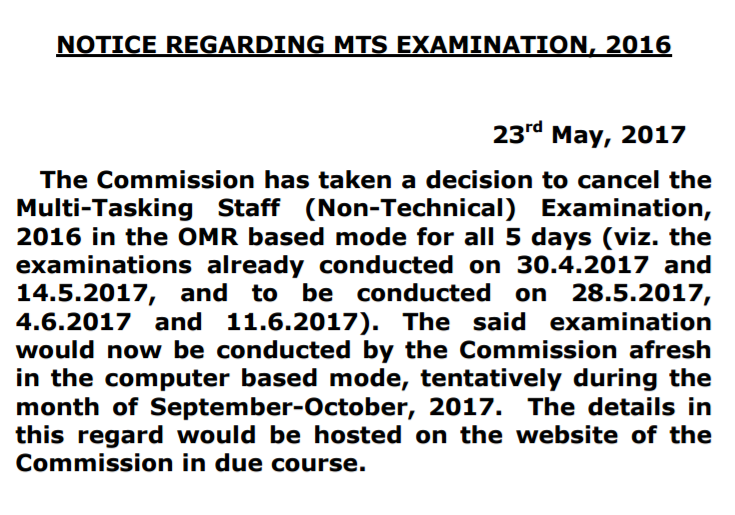 Online examination for SSC MTS has now once again scheduled to be held from September to October 2017. Check out the full exam schedule given below. The Staff Selection Commission (SSC) has finally re-announced its MTS exam date. They are now all set to conduct Online examination for Multi-Tasking Staff on new dates. SSC is going to held Online examination for MTS (Non-Technical) posts in various department of Indian Government. SSC MTS Admit card to will be published in August and exam will be held on following dates. The online exam dates for SSC MTS has scheduled to be held on Online mode. Aspirants can check the SSC MTS exam new dates 2017. SSC MTS Online exam is going to be held in September & October when earlier it was scheduled to be held as written exams. All those candidates who are going to appear for SSC Multi-Tasking Staff exam must know when SSC MTS exam will be held? What’s exam date of SSC MTS? According to the sources from Staff Selection Commission, SSC MTS Written Exam to be commencing from 30th April 2017. Due to the SSC MTS Exam Paper Leak in written examination earlier this year, SSC Multi Tasking Staff written exam date has been revised. Now they are preparing for conduction of SSC MTS Exam in Online mode. Applicants are hereby informed that the SSC MTS 2016 exam is going to be held in September & October 2017 in Online mode, they should be ready for it.